Constellations are patterns of stars in the sky that skygazers have used since antiquity to navigate and learn about space. Sort of like a game of cosmic connect-the-dots, stargazers draw lines between dots of bright stars to form familiar shapes. Some stars are much brighter than others, but the brightest stars in a constellation are visible to the unaided eye, so it's possible to see constellations without the use of a telescope. 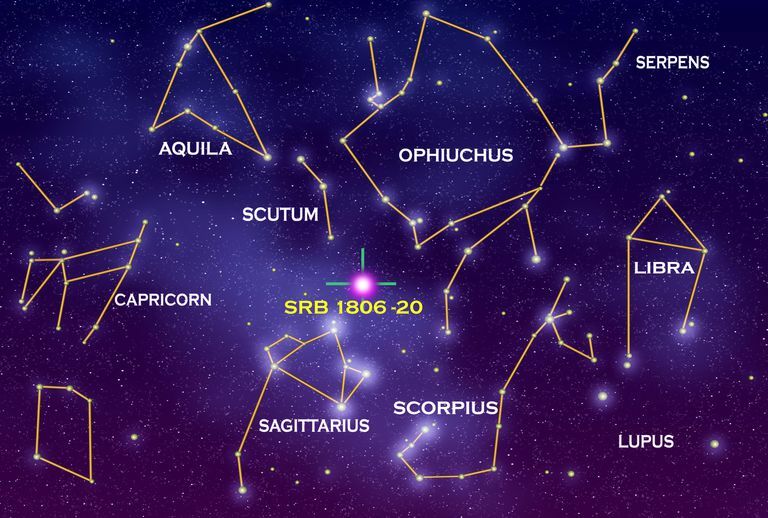 There are 88 officially recognized constellations, visible at different times throughout the year. Each season has distinctive star patterns because the stars we see in the sky change as Earth orbits the Sun. The Northern and Southern Hemisphere skies are very different from each other, and there are some patterns in each that cannot be seen between hemispheres. The easiest way to learn the constellations is to see them in seasonal charts for both north and south latitudes. Northern Hemisphere seasons are the opposite for Southern Hemisphere viewers, so a chart marked "Southern Hemisphere winter" represents what people south of the equator can see in their winter. At the same time, Northern Hemisphere viewers are experiencing summer, so those southern winter stars are actually summer stars for northerners. In general, most people can see about 40-50 constellations over the course of a year. Keep in mind that many star patterns do not look like their names. Andromeda, for example, is supposed to be a lovely young lady in the sky. In reality, however, her stick figure is more like a curved V extending from a box-shaped pattern. People use this V to find the Andromeda Galaxy. Also, remember that some constellations cover large parts of the sky while others are very small. For example, Delphinus, the Dolphin is tiny compared to its neighbor Cygnus, the Swan. Ursa Major is medium-sized but very recognizable. People use it to find Polaris, our pole star. It's often easier to learn groups of constellations together, so you can draw connections between them and use them to locate each other. For example, Orion and Canis Major and its bright star Sirius are neighbors, as are Taurus and Orion. Successful stargazers "star hop" from one constellation to another using bright stars as stepping stones. The charts included in this article show the sky as seen from latitude 40 degrees North at around 10 p.m. in the middle of each season. They give the name and general shape of each constellation. Good star chart programs or books can provide a lot more information about each constellation and the treasures it contains. Finally, most of the patterns we see in the following charts are based on the stick figures taught by H.A. Rey in his book "Find the Constellations" and are used in many other books as well. In the Northern Hemisphere, winter skies hold some of the loveliest constellation views of the year. Looking north gives skygazers a chance to see the brightest constellations Ursa Major, Cepheus, and Cassiopeia. Ursa Major contains the familiar Big Dipper, which looks very much like a dipper or ladle in the sky. Its handle points directly to the horizon for much of the winter. Directly overhead lie the star patterns of Perseus, Auriga, Gemini, and Cancer. The bright V-shaped face of Taurus the Bull is a star cluster called the Hyades. In the Northern Hemisphere, looking south during the winter provides a chance to explore the rest of the bright constellations available during December, January, and February each year. Orion stands out among the largest and brightest of the star patterns. He's joined by Gemini, Taurus, and Canis Major. The three bright stars that make up Orion's waist are called the "Belt Stars" and a line drawn from them to the southwest ends up at the throat of Canis Major and the star Sirius. Sirius is the brightest star in our night-time sky and is visible from around the world. While Northern Hemisphere skygazers experience colder temperatures during winter skygazing, Southern Hemisphere gazers are reveling in warm summer weather. The familiar constellations of Orion, Canis Major, and Taurus are in their northern sky while overhead, the River Eridanus, Puppis, Phoenix, and Horologium take over the sky. The summer skies of the Southern Hemisphere feature incredibly beautiful constellations that run along the Milky Way to the south. Look for Crux (also known as the Southern Cross), Carina, and Centaurus — which is home to the famous Alpha and Beta Centauri, among the closest stars to the Sun. Scattered among these star patterns are star clusters and nebulae that can be examined with binoculars and small telescopes. With the return of spring temperatures, Northern Hemisphere skygazers are greeted with a panoply of new constellations to explore. Old friends Cassiopeia and Cepheus are now very low on the horizon and new friends Bootes, Hercules, and Coma Berenices are rising in the East. High in the northern sky, Ursa Major, and the Big Dipper take over the view. Leo the Lion and Cancer grab the view high overhead. The southern half of the spring skies show Northern Hemisphere skygazers the last of the winter constellations (such as Orion), and bring new ones into view: Virgo, Corvus, Leo, and a few of the more northerly Southern Hemisphere star patterns. Orion disappears in the west in April, while Bootes and Corona Borealis make their evening appearance in the east. While Northern Hemisphere folks enjoy the spring season, people in the Southern Hemisphere are entering the autumn months. Their view of the sky includes the old summer favorites, with Orion setting in the west, along with Taurus. This view shows the Moon in Taurus, although it appears in different places along the zodiac throughout the month. Eastern sky shows Libra and Virgo rising, and the constellations of Canis Major, Vela, and Centaurus are high overhead, along with the stars of the Milky Way. The southern half of the Southern Hemisphere sky in autumn showcases the bright constellations of the Milky Way overhead and the far south constellations of Tucana and Pavo along the horizon, with Scorpius rising in the East. The plane of the Milky Way looks like a fuzzy cloud of stars ​and contains many star clusters and nebulae to spy out with a small telescope. The skies of summer in the Northern Hemisphere bring us the return of Ursa Major high in the northwestern sky, while its counterpart Ursa Minor is high in the northern sky. Closer to overhead, stargazers see Hercules (with its hidden clusters), Cygnus the Swan (one of the harbingers of summer), and the sparse lines of Aquila the Eagle rising from the east. The pleasant weather makes stargazing very enjoyable. The view toward the south during Northern Hemisphere summer shows the brilliant constellations Sagittarius and Scorpius low in the sky. The center of our Milky Way Galaxy lies in that direction between the two constellations. Overhead, Hercules, Lyra, Cygnus, Aquila, and the stars of Coma Berenices surround some deep-sky objects such as the Ring Nebula, which marks the spot where a star like the Sun died. The brightest stars of the constellations Aquila, Lyra, and Cygnus form an unofficial star pattern called the Summer Triangle, which remains visible well into autumn. While Northern Hemisphere viewers enjoy summer weather, skygazers in the Southern Hemisphere are in the throes of winter. Their winter sky contains the bright constellations Scorpius, Sagittarius, Lupus, and Centaurus right overhead, along with the Southern Cross (Crux). The plane of the Milky Way is right overhead, too. Farther north, they see some of the same constellations as northerners do: Hercules, Corona Borealis, and Lyra. The winter night sky to the south from the Southern Hemisphere follows the plane of the Milky Way to the southwest. Along the southern horizon are smaller constellations such as Horologium, Dorado, Pictor, and Hydrus. The long stanchion of Crux points down to the southern pole (where there is no star as there is in the north (Polaris)). To see the hidden gems of the Milky Way, observers should use a small telescope or binoculars to scan this expanse of bright stars. The viewing year ends with brilliant skies for Northern Hemisphere autumn. The summer constellations are sliding west, and the winter constellations are starting to show up in the east as the season wears on. Overhead, Pegasus guides viewers to the Andromeda Galaxy, Cygnus flies high in the sky, and tiny Delphinus the Dolphin glides along the zenith. In the north, Ursa Major is sliding along the horizon, while W-shaped Cassiopeia rides high with Cepheus and Draco. Northern Hemisphere autumn brings skygazers a look to some Southern Hemisphere constellations that are just visible along the horizon (depending on where the viewer is located). Grus and Sagittarius are heading south and west. Scanning the sky up to the zenith, observers can see Capricornus, Scutum, Aquila, Aquarius and parts of Cetus. At the zenith, Cepheus, Cygnus, and others ride high in the sky. Scan them with binoculars or telescope to look for star clusters and nebulae. Spring skies in the Southern Hemisphere are enjoyed with warmer temperatures by the folks south of the equator. Their view brings Sagittarius, Grus, and Sculptor high overhead, while the northern horizon glitters with the stars of Pegasus, Sagitta, Delphinus, and parts of Cygnus and Pegasus. The Southern Hemisphere spring sky view to the south features Centaurus (and its two famous bright stars Alpha and Beta Centauri) on the far southern horizon, with Sagittarius and Scorpius headed west, and the river Eridanus and Cetus rising in the east. Directly overhead are Tucana and Octans, along with Capricornus. It's a great time of year for stargazing in the south ​and brings our year of constellations to a close.